Mochi Craft 51 Dolphin boats have their own charm. It would not be wrong to call it a classic. The first model was launched by Ferratti Group. It is a comfortable and at the same time, very sophisticated style. The interior is comprised of a master cabin, a guest cabin and a crew cabin. Dark woods and leather upholstery makes the interior warm and inviting. The 51’ Dolphin is a great yacht, suitable for day trips as well as family cruises. We were delighted to work on this boat. The client decided on our most popular 7” commodore mattress for all 3 berths. Constructed with a 6″ latex core and covered in an ultra-soft bamboo quilting, our Commodore mattress is all about comfort. It can be made soft, medium or firm according to your choice. This client decided on soft for all of the cabins. The benefits of a latex mattress include being mold and mildew resistant, extremely comfortable, latex helps regulate body heat, which allows you to sleep cooler and it is bendable and breathable. If you love a plush mattress, then we recommend to try our 9” Admiral mattress. This one is made with a super comfy 6” medium latex core and then 2” ultra-soft latex pillow top is added on top and then we cover it in the plushest of bamboo quilting. The result is truly incredible. It is our promise, you would actually feel like you are in the bed of a 5-star hotel. Our Hybrid Captain mattress, on the other hand, is an economical way to enjoy the comfort of Latex and freshen up your stateroom. We start with a 3” base of hi density polyurethane foam and add 2 inches of soft latex and cover it in our plush bamboo quilting. 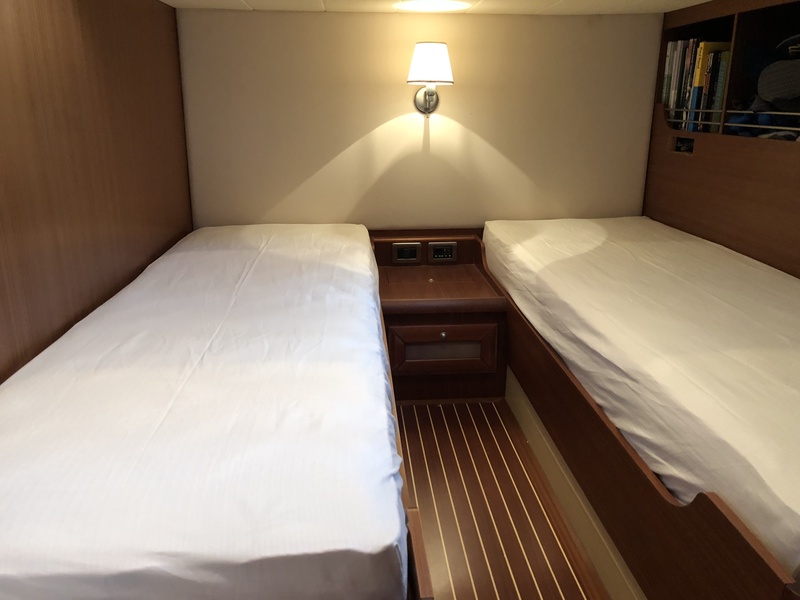 It’s the perfect choice for guest bunks and crew quarters. 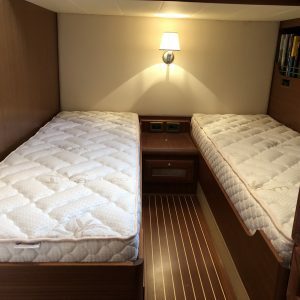 With several boat mattresses and toppers options to choose from, we have a solution for everyone. All our products are made custom to fit the size and shape of your bed and we use the best materials to go well with the marine environment. 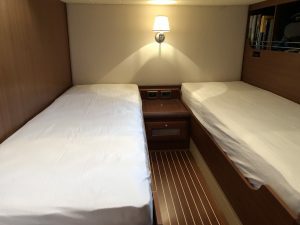 The designer recommended Sferra sheets for this 51’ because every Italian boat deserves Italian linens. For percale lovers, nothing compares to the crisp, cool feeling of bed linens woven in a simple, plain-weave style and that is what the Sferra Collection is all about. A comfortable mattress, soft and crisp fitting sheets and an easy to put coverlet in our beautiful intricate fabrics is all you need to give a fresh look to your stateroom and we sure can help.